Looking for an easy day trip from Playa del Carmen? Xpu Ha Beach, a long stretch of white sand south of Playa del Carmen and north of Tulum, is one of the best beaches on Mexico’s Riviera Maya coast for swimming, snorkelling or just chilling out. In fact, it offers such a perfect combination of clear, clean waters, limited undertow and soft white sand, it’s hard to believe it’s still under the radar of most visitors. Maybe it’s because its name doesn’t exactly roll off your tongue (pronounce it as shpoo-ha and you’ll be pretty close) but during our month-long stay in Playa del Carmen a few months ago, it was one of my favourite beaches. Xpu-ha beach is the kind of place you should visit now before the crowds arrive. Playa Xpu ha is located around 25 kilometers south of Playa del Carmen off Highway 307 on the way to Tulum. Although affected by the large quantities of sargasso seaweed that plagued beaches in Mexico and the Caribbean in the summer of 2018, the situation is expected to improve by year end 2018. Read more about the seaweed forecast below. 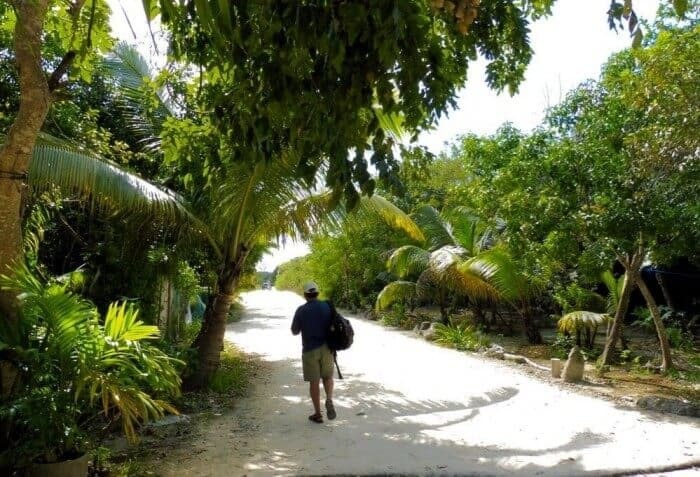 The good news is that it’s relatively easy to get to Playa Xpu-Ha, even if you don’t have your own car. You can take a taxi (we were quoted 350 MXN pesos for a one-way fare) or you can hop on one of the minivans known as colectivos. 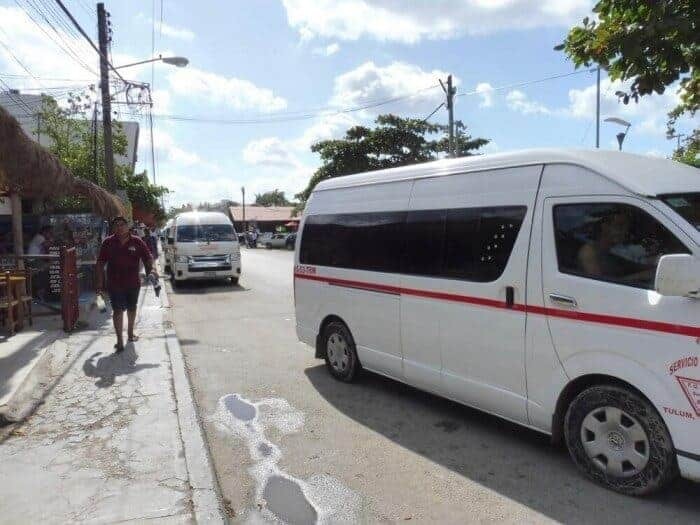 Unlike Puerto Escondido, Oaxaca where a colectivo is most often a pick-up truck with a buzzer in back, here on the swanky Riviera Maya, they are air-conditioned, relatively new mini-vans, complete with seat belts. Not only are they comfortable but they are cheap. Our ride (one-way) cost just 70 pesos ( under $4 USD) for 2 people. You can catch a colectivo in Playa del Carmen at the corner of 20 Avenida and 2 Calle Norte, a 5 minute walk from Walmart. The vans headed to Tulum will be pointing north on the street. You just climb into one with an open door, grab a seat and tell the driver where you are going. How to pronounce Xpu-ha? The pronunciation of Xpu-ha is pronounced shpoo-ha (shouting “poo-pa” from the back of a crowded van is likely one of the most embarrassing things you could ever do ). Once the mini-van is full, it will depart, making stops along the highway to let other passengers out. You pay your fare when you get out. After a 20 minute ride, you’ll arrive at your highway stop ( km 265), then cross the highway, pay 40 pesos at the kiosk, get a wristband and walk down the dirt road with the sign for La Playa restaurant, home of the Xpu-Ha Beach Club. Save your food bill so you can get a refund of your 40 pesos on your way out ( assuming you leave before 6 pm). It’s an easy 10 minute walk, past mangroves and fruit trees, and is mostly shady. 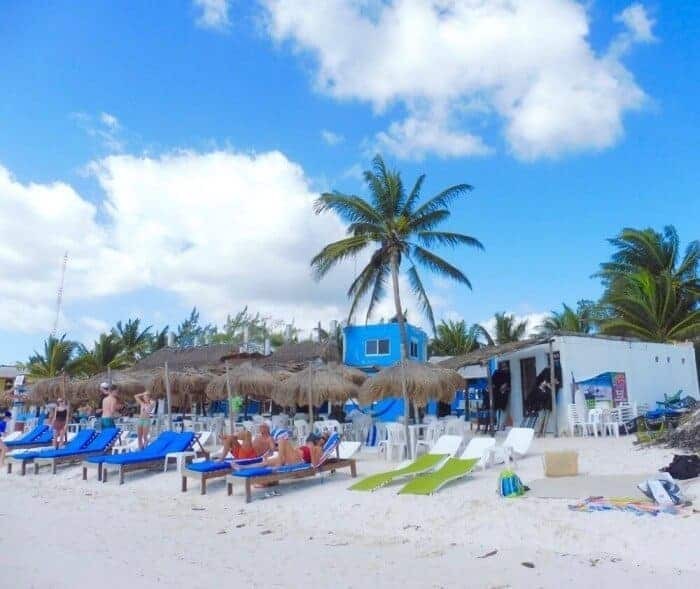 Unless you bring your own beach chairs, food and drink, your best option for the day is Restaurant La Playa. It’s hard to miss it as it’s the largest restaurant on the beach. The clamshell chairs and tables are free to use for the whole day with a minimum order of food and drink. This gets you access to tidy washrooms with flush toilets, showers, lockers and change rooms. It’s also very family-friendly. On calm days, the water is fine for swimming, snorkelling or just splashing about. It’s one of the best beaches in Mexico for families. Even non-swimmers ( like me) will find it an easy spot to swim, assuming you don’t arrive on a windy day. If it’s windy you can always go kitesurfing. But what most people do is just hang out and relax on the beach. Sip a cocktail, order a bucket of beer, go for a long walk or, if you plan your visit and arrive on a Saturday or Sunday around 2:30 pm, you can listen to live jazz or salsa music at Restaurant & Beach Club La Playa. Prices aren’t as low at Restaurant & Beach Club La Playa as they are in the heart of Playa del Carmen. 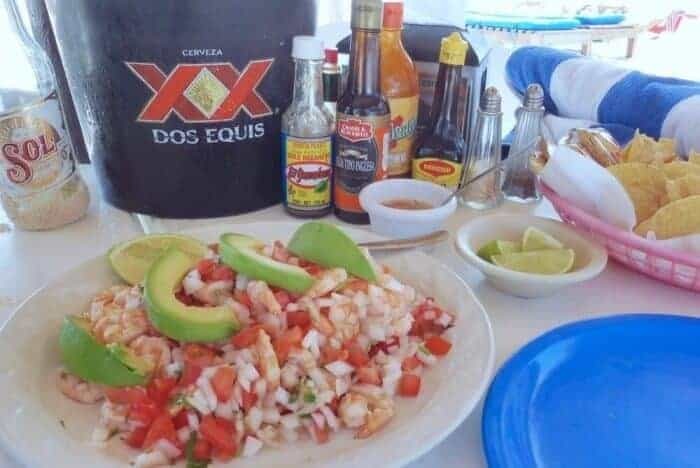 Expect to pay 180 pesos for ceviche or aguachile (a tasty combo of shrimp mixed with tomato, cucumber, cilantro, lime, serrano chile and red onion). If you’re nervous about eating raw seafood, you don’t need to worry here. At Restaurant & Beach Club La Playa, the shrimp is boiled before it’s mixed with the vegetables. A huge double order of ceviche is 330 pesos ($18 USD) and comes with enough condiments to stock an OXXO store. A bucket of six beer is 150 MXN pesos (8 USD). Wine is 55 pesos a glass and a Michelado 15 pesos. There’s even a kid’s menu, which makes Xpu Ha Beach one of our top choices for a family-friendly vacation on the Riviera-Maya. Note: This post contains affiliate links. Check our Disclosure page for details. 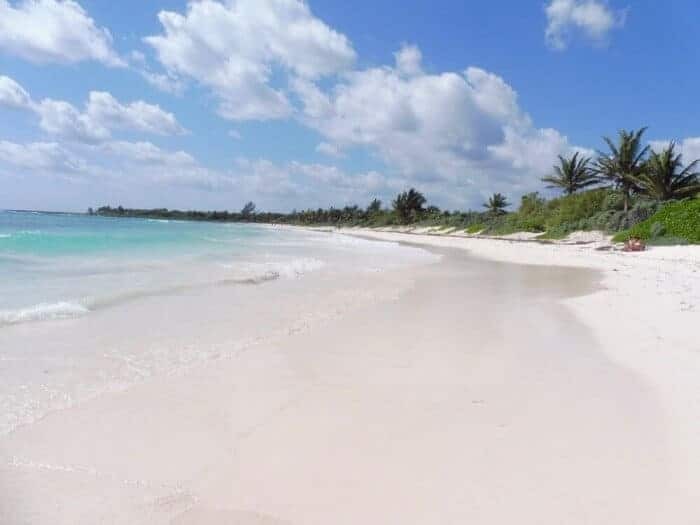 Like much of the Caribbean coast of the Mexico stretching from Cancun to Tulum, this stretch of the Riviera Maya was affected by historic quantities of sargassum seaweed in 2018. If you’re planning a beach vacation for winter 2018 -2019 and have been worried about the current seaweed conditions at Xpu-Ha, you’ll be pleased to know that the Riviera Maya’s beaches are recovering from the sargassum seaweed this summer. Read our report on the current Seaweed Conditions in Cancun (from November 2018,) learn about the health hazards of swimming in sargassum seaweed and get information on the seaweed forecast for the balance of 2018. If you’re planning a vacation at Xpu-Ha or the nearby Catalonia or Belair Collection Resort & Spa, it’s important to note that conditions can change daily depending on tides and water temperature. To monitor current seaweed conditions, you have a few options. Check the webcams such as the Akumal Beach Webcam to see live feeds of beach images that update every 10 seconds throughout the day. In Cancun, Mexico you can check the Live Aqua Webcam to see live video frames updated every 15 seconds. You can also check the Sargassum Early Advisory System (SEAS), a forecasting project based in Texas intended to help predict the movement of sargassum blooms. Originally created in 2013 to help with forecasting of the large Sargassum landings in Texas, it now provides forecasting for the Gulf Coast, Mexico and the Caribbean. This post contains affiliate links. Read our Disclosure Page for more information. Restaurant & Beach Club La Playa: The beach club and restaurant is open daily. In low season the hours are 11:00 am to 7:00 pm and during High Season ( Winter) hours are 10:00 am to 6:00 pm. In high season, arrive early, as lounge chairs disappear fast. Live music begins at 2:30 pm on Saturday and Sunday. Visit the website at Restaurant & Beach Club La Playa for more details. Serenity Luxury Eco-tents: Asian-inspired glamping tents are located directly on Xpu-ha beach. The range of accommodation is from one bed accommodation to a double with a king and a queen size bed so Serenity is a good option for families. If you’re looking for beachfront hotels near Tulum, check our post on the most romantic hotels in Mexico for more options. I love the white sand at Xpu-ha. It looks like a place I’d enjoy relaxing for the day. I too am not a swimmer, but enjoy being by the water and playing in it. I imagine I’d have a few giggles trying to pronounce it though. I wouldn’t have even tried to say “Xpu-ha” so thanks for providing the pronunciation! I’ve heard that it’s in Mexico where the beaches are simply lovely and this place has them too. Getting away in the winter to somewhere warm with fresh food is what I need to do next year! I found your article about the beach at Xpu-ha (did I pronounce it correctly?) very interesting, although I tend to prefer city beaches to remote beaches. But the ease of access via the colectivo and the beautiful picture of the shrimp ceviche with the bucket of beers may make me think again! Thanks for a great posting! I love these kind of relatively unspoilt kind of beaches, they have sucha a pure beauty associated with them, just like a piece of paradise. Never been to those places in Mexico. Looks like a gorgeous beach. Thanks for sharing! Great article! I was recently in the Riviera Maya and couldn’t find much info on the smaller beaches so will definitely have to check it out next time I’m there. Xpu-Ha Beach looks so pretty! We visited the Riviera Maya late last year — but unfortunately didn’t make it to Xpu-Ha. It’s great you mention taking a colectivo to get there. We caught many of them to travel up and down that highway (e.g., from Playa down to Tulum). Soooo much less expensive than taking a taxi, which really isn’t necessary. Absolutely gorgeous, and looks to be so much less crowded than many of the other beaches along the Riviera Maya. Great info! Xpu-Ha Beach looks like a place I would love to visit…and the ceviche looks so amazing!! Xpu-Ha looks like a great find. We love going to beaches that aren’t that crowded yet you can still get a great lunch and a cold cerveza. We’ll check it out next time we’re in Playa. East coast Mexico is full of great beaches and activities, I never get tired of it! Thanks for sharing. Looks beautiful! We love Akumal because of the beach, the turtles and the snorkeling. 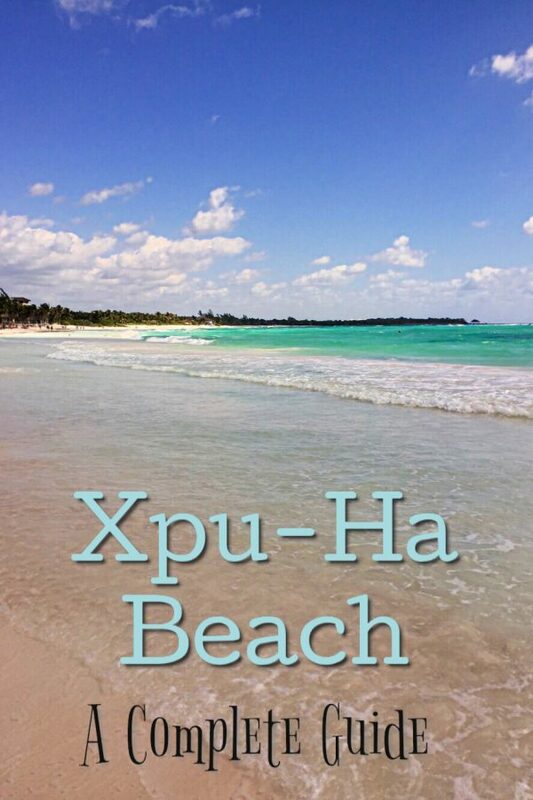 Now that I know more about Xpu-Ha, we’ll have to visit the next time we go to Riviera Maya. We used the Colectivo to travel to Tulum and Dos Ojos (the fresh water caves for snorkeling and diving). Colectivos are very inexpensive way to travel and you get closer to the locals. That’s the kind of advice I like. I’m sure it’s not that easy to find quiet beaches in Mexico. Xpu-ha looks stunning! Great timing! Our son and DIL are heading to Playa del Carmen in July- I’ll share Xpu-ha with them. There aren’t too many undiscovered beaches in Mexico these days. Ph… to enjoy an entire month! Lovely! The beach looks incredible – and the ceviche, yum! Perfect place to get away from it all! Funny! I am just writing a blog right now on the same subject! it is one of my favourite beaches! great pictures! Great! Looking forward to reading your post!